Madrids Museo del Prado is now considered to be home to one of the worlds most formidible collections of middle age art & sculpture in Europe. Certainly one not to miss during your visit to Madrid. Housing the Spanish royal family´s extensive collection in a convenient downtown location there is no reason not to visit! 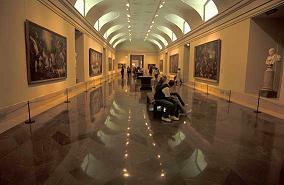 Even more so considering that the doors of the Del Prado gallery are open to all free every Sunday! One has to consider that the pieces in the Museo del Prado were originally aquired when Spain was at the height of its power and had many trading links to France and Italy as well as then being the governors of Holland and Belgium. The wealth of the Spanish empire at the time can be seen in the sheer variety of pieces that make up the gallery´s permanent collection. Spread over four floors the Museums permanent collections cover European art history between 1100 and 1800AD. Whilst over 50% of the pieces on display are from Spanish artists there are a considerable number of works from other prominent artists. Basement: Decorative arts incluing the "Grand Dauphin" and "pietre dure and cassoni" desks. In addition to the above major works by Gentileschi, Brueghal and Van Dyck can be found intermixed on the main floor. Closed Mondays, Good Friday, 1st May and 25th December. Free entry is availble for: all under 18´s, all EU citizens over 65, EU unemployed citizens, Members of APEME, ANABAD, AEM and ICOM, Teachers. An alternative is to purchase the "Paseo de Arte" which for 14,40€ allows entereance to the Thyssen and Reina Sofia galleries in addition to the Museo del Prado. 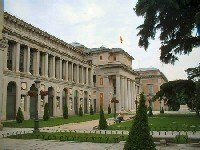 The Museo del Prado is a central Madrid Landmark in its own right and sits aside the street "Paseo Del Prado" named after it and running between Atocha and Plaza de Cibeles. Metro and Bus: Atocha, Plaza de Cibeles & Banco de Espana.